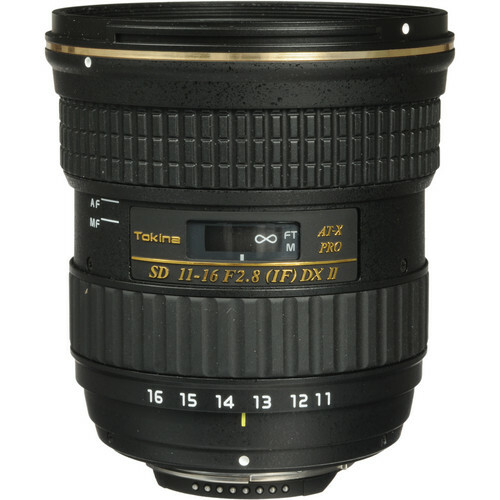 The AT-X 116 PRO DX-II 11-16mm f/2.8 Lens for Nikon F by Tokina is an ultra-wide angle autofocus zoom lens with a fast constant f/2.8 maximum aperture. The AT-X 116 PRO DX-II lens is designed for digital cameras with APS-C-size CMOS or CCD sensors. Its angle of view ranges from 104-84° and it can focus as close as 11.8". Nine diaphragm blades help to produce soft out-of-focus backgrounds while two Super-Low Dispersion glass elements and two aspheric elements help to achieve excellent contrast, sharpness and minimal chromatic aberration. As an update to their AT-X 116 PRO DX, Tokina has improved the multi-layer coatings to minimize light reflection and improve optical performance. This updated PRO DX-II also has an internal silent focusing motor that allows the lens to utilize autofocus on Nikon cameras that do not have an AF drive gear and motor. Tokina's One-Touch Focus Clutch Mechanism allows the photographer to switch between autofocus and manual focus with a simple push of the focus ring. Snapping it forward into autofocus and back into manual focus is all that needs be done, there's no need to adjust the AF/MF switch on the camera body. A constant f/2.8 maximum aperture benefits working in low-light situations and also aids in creating a shallow depth of field. An internal silent focusing motor allows the lens to use autofocus on Nikon bodies that do not have an AF drive gear and motor. Two Super-Low Dispersion glass elements and two aspheric elements, as well as improved multi-coating, achieve excellent sharpness and contrast and reduce aberrations. The One-Touch Focus Clutch Mechanism offers a simple switch from manual focus to autofocus and back again. The focus ring snaps forward for AF and back for MF. It's operable with one hand and eliminates the need to switch from AF to MF on the camera body. Box Dimensions (LxWxH) 6.6 x 5.3 x 5.1"
AT-X 116 PRO DX-II 11-16mm f/2.8 Lens for Nikon F is rated 4.6 out of 5 by 518. Rated 4 out of 5 by Steve from Solid, Feels Good I'm happy with the performance of this lens. The images are sharp, the auto focus works well, and f2.8 is great indoors. I use it most outdoors for nature photos, like wild flowers and spiders (to get the whole web). The push/pull ring is solid. I'm not too worried about it getting a bit dirty or wet. The lens shade is big and will cast a shadow with the pop-up flash, the lens alone will cast a small shadow at the bottom of the photo. I use a Nikon D7100. I tried a friend's Nikon 10-20mm, it is a good lens. For a little more money (the Tokina was on sale), the Tokina lens is much better. What would get five stars? I would like a closer focus distance. Rated 4 out of 5 by HG from So far so good I bought this for my Canon T2i. It works great, The auto-focus is fast but once a while it can't focus correctly, not sure why but if I can find ways to work around it, I am sure others can as well. I was debating whether to get Tokina 11-16mm F/2.8 or Canon's 10-22mm F/3.5-4.5. I really wish to get the 10mm feature but ultimately decide that F/2.8 works better for me at night. Other review pointed out the soft corner effect but that doesn't bother me too much. Overall, I like it, but it's still not perfect. This one comes with lens hood...and I found it unnecessary, so I probably paid a few more bucks for something that I don't need. Rated 5 out of 5 by sfried from Great lens. Completely new POV!! I bought this product in anticipation of an upcoming trip to Jerusalem where I thought that the ancient buildings and streets would require a UWA lens for my D7100. I purchased at B&H knowing that I could easily return it if I was not satisfied with the lens performance. As soon as I purchased it, I walked the streets of NYC and began photographing. I was really surprised at the quality of the pictures. Distortion is very well controlled. I can get images that are very different even from my 16-85. At 11mm I can get very close to a subject and still capture all of the background. The constant 2.8 aperture will be useful in tight alleys and inside museums. I am very happy with this purchase. Rated 5 out of 5 by hale-bopp from Excellent for Astrophotography I bought this lens primarily for use in wide field astrophotography. The image is very good, even wide open. There is some vignetting but not too much (and easily correctable). Chromatic aberration is slight and not a major issue. I shot several nights from a mountain in Chile and from dark sites around Tucson. This lens is becoming one of my workhorses. I have also found it to be very good in tight spaces such as observatory domes where you need a very wide field and can't get very far away from your subject. You are going to have a hard time beating the value of this lens if you are interested in this type of photography. It can be tough to attach in the dark...practice in the daytime first! Rated 4 out of 5 by Richard S. from Great for star photography I bought this lens primarily to shoot meteors, Milky Way and the like. Haven't had a chance at a metoer shower yet, but I've gotten good results on Milky Way photos (on a Nikon D7100 12mm @ 2.8, 20 sec and ISO 1000).Feels solid, sharp. Not very quick autofocus, but not that important in an ultra wideangle lens.I wish it focused closer. I shoot wildflowers and small animals (frogs, spiders, etc). I like to take closeups that include habitat in the background, and for small flowers or insects this lens doesn't focus as close as I'd like. Rated 5 out of 5 by grizzhunter from Awesomeness I live n Alaska and have rented this lens a few times from my local camera store. I finely broke down and bought 2!!!! I use them for photographing the northern lights. They are the only lens I have found that has the super wide angle I need with the fast 2.8. If you are looking for a sweet fast wide angle lens I would most defiantly recommend this lens. And I have to my fellow aurora photographer friends. Is this lens cover by a warranty in Canada? I am sorry it would not. This comes with a 3 year US manufacturers warranty. Will this lens provide me with optimal performance using a d300 or do you recommend a different body? This lens will provide you with optimal performance on all current &amp; older Nikon DSLR cameras like your D300. will this lens work with d700? Yes this Tokina AT-X 116 PRO DX-II 11-16mm f/2.8 Lens for Nikon F includes a 3-year Limited USA Warranty with Tokina. Does it comes with an international warranty? The warranty on this lens is Tokina USA. Before I load this lens into my cart, I want to make sure this lens is 100% compatible with my Nikon D5100. Is it?Thank you kindly! 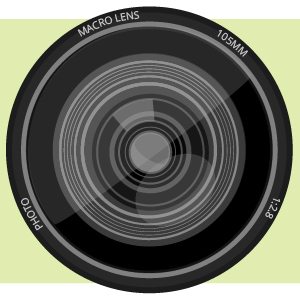 Yes, that lens will work with your camera, including the Auto Focus. Will this also work with a D200? This lens should have no problems working with a D200. Will I be able to use this lens with my Nikon d-5200 using the autofocus? Yes, you can use autofocus with the Tokina 11-16mm f/2.8 lens on a Nikon D5200. This lens has a built-in focus motor.